In March 1938 the Czech author and painter Růžena Urbanová set off from Marseilles on a journey round the world. In the Dutch East Indies she made a substantial collection of objects, now in the Náprstek Museum in Prague. 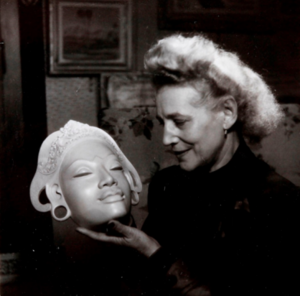 Urbanová’s journey was abruptly ended when she was interned by the Japanese in 1942. She eventually returned to Europe in 1946. This talk, illustrated with her photographs, focusses on the kind of experiences which Urbanová, and others travelling between the wars, encountered. What kind of objects did she collect and what does this tell us about contacts and encounters between Indonesians and travellers? The talk is based on the book ‘Collecting Experience in the 1930s: Růžena Charltta Urbanová and her collection in the Náprstek Museum, Prague’, by Fiona Kerlogue and Dagmar Pospíšilová, published in 2018 by the Prague National Museum.